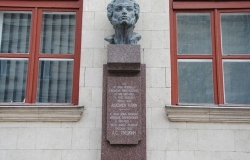 Speaking of bust A.S Pushkin, an idea occurs to our mind that it is the one established in the Chisinau central park, however, it is not the only one place where you can find the monument to the Great Russian poet. Sep 15, 2015 The exhibition "Hora of Colors"
May 03, 2015 The exhibition "Natural and historical monuments of Reserve Tipova-Saharna"
May 03, 2015 "Easter of Third Day"
Apr 09, 2015 Seminar "How to colour Easter eggs"
The very first museum in Moldova was founded by Baron Steward back in 1889, and during the 20th century it was a work laboratory for many individuals that are widely known in the world of science: S. Miller, F. Ostermann, F. Poruchik, B. Tarabuhina, I. Suhova, M. Pokoare and others. The museum was built in the oriental style in 1905 and is a unique building in Moldova. Throughout its history, the museum was devoted to two specific areas - the study of the nature and culture of Moldova. The institution itself had several names: the National Museum of Natural History, Regional Museum of Bessarabia and Republican Museum of Native Land Studies. The museum is popular with visitors due to its rich paleontological, geological, zoological, archaeological, entomological, ethnographic and numismatic collections. Among the many thousand exhibits, visitors can see the complete skeleton Dinoterium Gigantisimus, famous archaeological treasures, Bessarabian carpets of 19th century and much more. The museum's collections have been often exhibited in Europe, Asia, America and Africa as a national cultural heritage of Moldova. The museum is located in the historic architectural complex of Chisinau, built in 1889 and executed in pseudo-Moorish style. In this oldest museum of Republic of Moldova are the richest and the priceless collection. The fund has more than 135 thousand exhibits of national, European and universal importance. Many artifacts are exhibited in various countries in Europe, Asia, America and Africa. Museum heritage is defined by collections of natural history, ethnography and natural history, history, archeology, ancient books and etc. Paleontological and geological collections reflect the evolution of the organic world and the geological history of the earth. These include relics of flora and fauna, successive in different geological periods. The gem of the museum is a complete skeleton supergiant dinothere (Deinoterium gigantissimus), once lived on our planet 7 million years ago. Modern nature is represented in zoological and botanical collections. A certain pride of place must be given to herbaria and stuffed animals from the late 19th - early 20th centuries, which disappeared forever from the natural environment of the Republic of Moldova. Botanical collections are complemented by Botanical Garden, organized at the museum in 1906. Development of cultural and historical civilizations is reflected in collections of history, numismatics, archeology, ethnography and art. In the museum there are famous treasures of such villages as Lerguta, Cetrosica, Carbuna, there are priceless collections of weaving, national clothes, ceramics, furniture, folk architecture, musical instruments, etc. The museum also exposes the valuable collection of Moldovan carpets late 18th -20th centuries. Permanent exhibition of the Museum of Ethnography called "Nature. Man. Culture" introduces visitors to the development of the human relationship with Mother Nature, reflecting its important role in the universe. Additionally the museum gives visitors the opportunity to get acquainted with traveling exhibitions of their own exhibits as well as artifacts borrowed from other museums.